Rwandan women selling eggs to people visiting the Kimironko market in the country capital city, Kigali (photo credit: Shutterstock.com/Sarine Arslanian) All rights reserved. Rising demand for milk, meat and eggs in developing countries is opening up big new opportunities to establish and grow businesses and create jobs. While rapidly changing livestock systems pose a range of environmental, health and equity challenges across the highly heterogeneous livestock production systems worldwide, targeted investment in sustainable livestock research for development can produce more food, increase resilience in communities and the environment, and drive equitable and broad-based economic growth. Helping to ensure that hundreds of millions of poor small-scale livestock farmers, processors and marketers, many of whom are women, benefit from these opportunities will be crucial to achieving many of United Nations Sustainable Development Goals (SDGs). 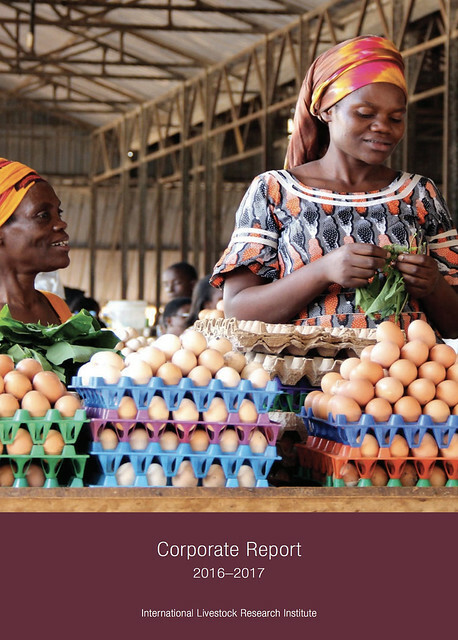 The Board of Trustees, management and staff of the International Livestock Research Institute (ILRI) take great pleasure in announcing the publication of the ILRI Corporate report 2016–2017. Each chapter in the report outlines how research for development approaches—undertaken by an array of national and international private, public and research partners—have brought tangible benefits to low-and middle-income countries and communities, and offer lessons for adoption more broadly for livestock producers, marketers and farmers elsewhere. . . .